Part of city, Rangiyan Mundir, [Kota]. bl.uk > Online Gallery Home	> Online exhibitions	> Asia, Pacific and Africa Collections	> Part of city, Rangiyan Mundir, [Kota]. Photograph from the Curzon Collection: 'Visit of His Excellency the Viceroy. 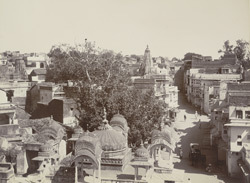 Kotah, November, 1902' of a general view of Kota, Rajasthan, taken by P.A. Herzog and P. Higgins in November 1902.